American Muslims and non-Muslims are reacting angrily to an e-mail by Tennessee Mayor Johnny Piper protesting the issuance of stamps commemorating two Muslim feasts. "(The e-mail represents) appalling ignorance of what Islam is, and who Muslims are,” Ahmed Joudah, president of the Islamic Center of Clarksville, Tennessee, told the Leaf-Chronicle on Saturday, September 5. In an e-mail circulated nationwide, Piper urged "patriotic Americans" to protest a US Postal Service stamp marking `Eid Al-Fitr and `Eid Al-Adha. “I was surprised at a stamp being developed, and would have thought others would be, too,” he said. 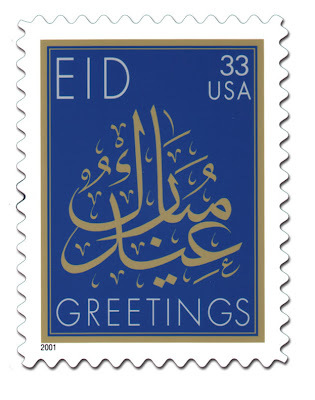 The stamp features the phrase ‘Eid mubarak,’ (or blessed feast) in Islamic calligraphy. It was first issued in 2001, and was reissued in 2002, 2006, 2007 and 2008. Piper said the Americans should not commemorate the holidays of those who attacked them, calling for a national boycott of the stamp. Joudah, the Muslim leader, said it is unfair to blame all Muslims for the actions of a radical fringe. Similarly, he said it would be unfair to resent all Clarksville non-Muslims for the acts of vandalism by a few against their local mosque. “I cannot deny and I cannot be unfair to my neighbor,” Joudah said.